Walt Disney World’s Yacht and Beach Club Resorts hold some of our very favorite restaurants between these two sister resorts that share several amenities. We’re always up for a meal at Beach Club’s Cape May Café, or even a satisfying sweet-tooth dessert at Beaches and Cream Soda Shop. And who could pass on the outstanding entrees offered at Yacht Club Resort’s Yachtsman Steakhouse? Well, we are pleased to have tried the newest eatery within the Yacht Club Resort known as Ale & Compass Restaurant and would like to share seven things you’ll want to know before dining there! 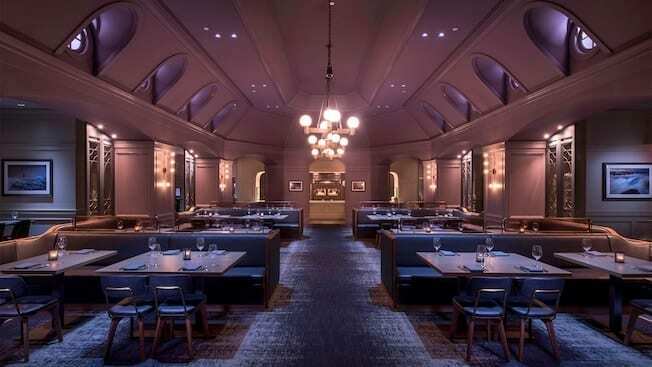 In October 2017, Yacht Club Resort began a dining transformation, unifying the quick-service dining, lobby lounge, and lobby restaurant with a general “Ale & Compass” dining theme. The Market at Ale & Compass is located down the hall from Yacht’s lobby (in the gift shop), and is a bright and modern quick-service option that is perfect grab and go food. 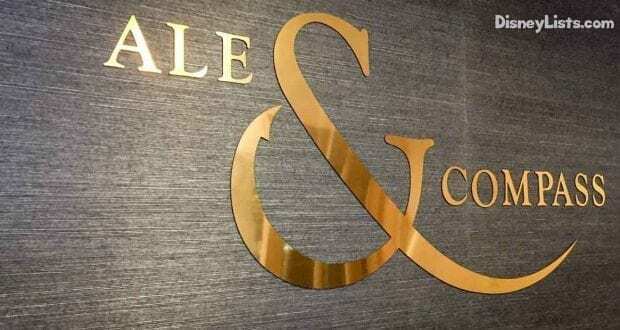 Look to the left when entering the Yacht Club lobby to find the elegant and sleek Ale & Compass Lounge with Ale & Compass Restaurant right next door. The overall Ale & Compass theme across all three of these locations is very modern and sleek but keeps that nautical, Yacht Club Resort feel. When Captain’s Grille closed in 2017 for “refurbishment”, we found ourselves more intrigued instead of disappointed. While we enjoyed the occasional meal at Captain’s Grille, it wasn’t a must-do on our list and more of a restaurant selection if it fit into our plans. While the restaurant was bright and airy, it was definitely lacking in décor with much outdated carpets, tables and chairs. It honestly was falling behind in what one would expect of a Yacht Club Resort restaurant. Ale & Compass opened November 21, 2017 with a much needed face-lift to the entire space. From floor to ceiling, the décor alone was a huge improvement as is the menu and taste of the food. Like Captain’s Grille, Ale & Compass Restaurant is still in a lighthouse shape with multiple circular windows and large open windows to the resort lobby and hallway. The new colors inside exude a nautical feeling with a dark blue hue overall. The seating transformation is awesome with a combination of bench seating mixed with chairs. The lighting and open floor plan offer a bright and airy space but it still makes for what could be an intimate meal. Wine glasses and blue cloth napkins dress the table for what feels like a high-end restaurant while still being a family-friendly location. The focal point upon entering the restaurant is definitely the open hearth oven area which has a bar top option with a few seats available. Also near the entrance is an open doorway where guests can enter the neighboring Ale & Compass Lounge. Something we love about Ale & Compass is that breakfast, lunch and dinner are totally different menus. We especially love when resort restaurants offer different meal options so you can have a totally different experience at each meal time if you wanted! On a typical day, breakfast is served between 7:30am-11:00am. All of your usual breakfast dishes are served up with a slight New England flare like the Cornbread Waffles or salted caramel apple French Toast. Go light with yogurt and granola or heavy with pancakes and their homemade hash. A great variety, especially for a breakfast menu! Lunch is served between 11:30am-2:00pm. 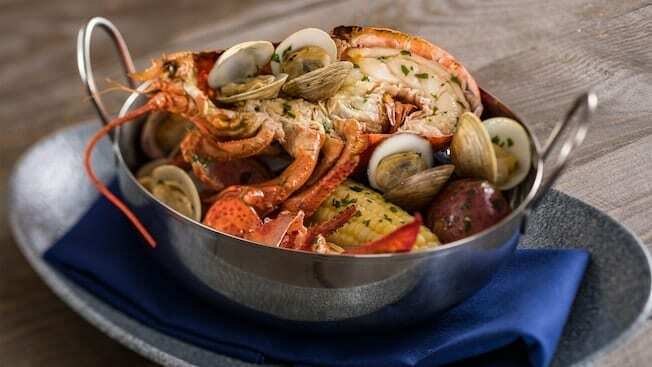 The stars on the menu are the seafood items like the Maine Lobster Roll or Hearth Oven Pie – White Clam. We did however enjoy some of the non-seafood dishes like the Smoked Turkey Sandwich (which tasted like Thanksgiving in the form of a sandwich!) and the tasty burgers. Dinner is served from 5:00pm-9:00pm. The menu transforms into more signature style dishes such as the Smoked Short Ribs, Coastal Clambake, and Seared Scrod just to name a few. Excellent selections for all three meals! Our kiddos especially loved the kid’s cheeseburger and cheese ravioli. Plus, our gluten allergy in the family was impressed at the amount of gluten-friendly options Ale & Compass offered. What meal is complete without dessert?! Lunch and dinner dessert highlights include the Trio of Puddings (Chocolate, Blackberry, and Butterscotch), Individual Apple Pie, and the Twelve-Layer Chocolate Cake. The restaurant is called ALE & Compass Restaurant after all, so you can expect to find refreshing alcoholic and non-alcoholic beverages on the menu. Alcoholic breakfast beverage recommendations would have to be the Captain’s Bloody Mary (served with a Lobster Claw and House-made Bacon Strip) or the Mimosa. Lunch and dinner drink menus offer great variety from fantastic ale, wine, and cocktail selections. We enjoyed the Seaworthy Breeze Cocktail which includes Yacht Club Vodka, grapefruit and cranberry juices. We were pleasantly pleased with Ale & Compass Restaurant’s Cast Members. The hostess was super friendly and eager to seat us right away. Our server was exceptionally helpful. She was very knowledgeable of the menu and was a huge help with our gluten allergy in the family. We especially loved how attentive she was to our children. She even brought them Mickey straws just for fun! The food arrived fast and the Chef’s must be well trained because the food looked and tasted wonderful. While we always recommend making Advanced Dining Reservations 180-days in advance of your dining date, we will say we were surprised to find dining reservations readily available for Ale & Compass Restaurant. While waiting to be seated for our lunch, we saw several people walk in with no reservations. Keep this resort restaurant in your hip pocket if you are in need of a last minute dining option. You’ll experience a relaxing atmosphere, great service, and excellent food and beverages! Have you tried Ale & Compass Restaurant? We’d love to hear about your experience!